Over the past few days we've listed a few new jewelry designs. Each of these features stamps that I drew and are exclusive to The Rusted Chain! Trust Your Wings - Such a positive message! I think this is my new favorite. 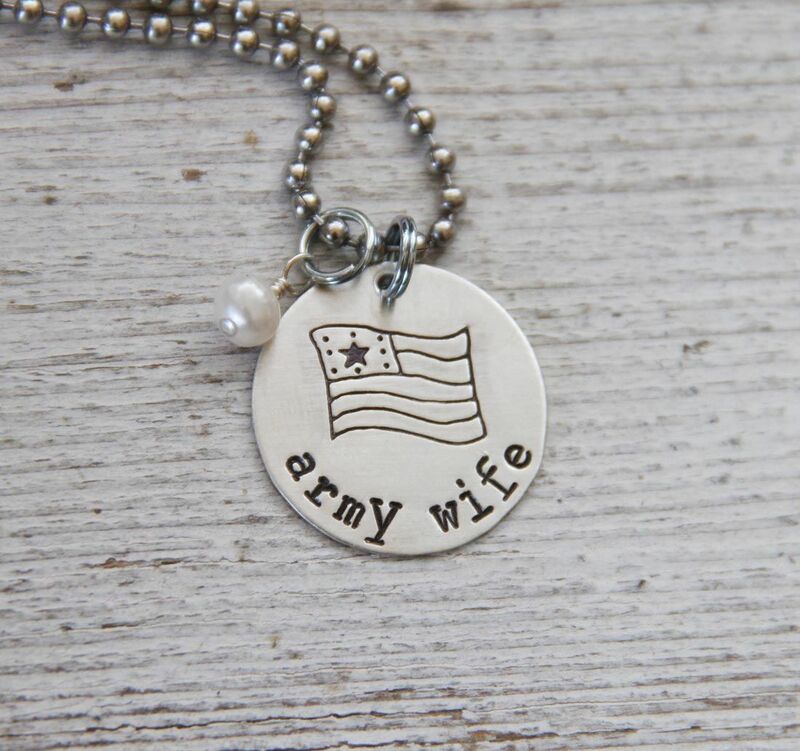 Military Wife - any branch! Army, Navy, Air Force, Marines. I just love this flag! This one! This is definitely my new favorite. Just Dance - Get it in a child's size, or an adult size!! Maybe this one's my new favorite! Yes, that's it. I love those ballet slippers. Because I love ya, and because it's Thursday, and because I really need no reason... Let's give away 2 $25 gift certificates! To enter: Simply leave a comment answering - Are you ready for summer? For additional entries: Facebook it, tweet it, or pin one of the above images (or something from our shop). Please leave additional comments for each of these you do. We'll pull two random winners soon. Yes, I am ready for summer! Swimming, reading, biking, picnic-ing (not sure that's a word!). Summertime is almost here! Love your new items! Trust your Wings is especially beautiful! I am ready for summer. The pool, campfires, Much needed family time! Lots to look forward to with summer coming faster then it should. I am so ready for summer. I have a 10 year old daughter who is an only child by God's choice. (we had 3 miscarriages after her) We love to camp almost every other weekend. Can't wait to enjoy the great outdoors. Totally ready! Peach cobbler, strawberry jam, s'mores, weenie roasts, homemade ice cream . . . BRING IT ON! Yes I'm ready for summer!!! Because summer means we get to move into our new house!!! Woohoo!!! I'm not sure if I'm ready for summer or not! I am ready for more leisure time with my kids, but I'm not ready for my afternoons to be taken away from me (my older son doesn't nap and is usually in school in the afternoons). I am loving my time with her and don't have to return to work until school starts again in August! I live in south TX where it is perpetually summer and you'd think growing up here I'd be used to the heat but I'm never ready for it. I am ready for summer. I have some great summer plans. We just came in from having a picnic and playing outside all morning... I am ready! I can't wait for summer! My little boy will turn one this summer and there is just so much for him to experience for the first time this time of year! We just finished mulching and planting in the gardens! so Yes, I am ready for summer! Ready for summer? It's HERE...at least in Mississippi. I'm very excited for summer...we've been getting the yard and patio all spruced up and ready! I'm also excited about this giveaway! Yes! Summer, summer here we come! Eh...Summers in Vegas are my least favorite time of year - too hot! Always ready for flip flops!! Thanks for chance to win!! Oh, I am MORE than ready for summer! My kids are so ready to be done with school, and I'm looking forward to some down time for all of us after a super busy spring! I am ready for summer! The garden is planted!! I am SOOOOO ready for summer! Hoping to finish my PhD this summer!! WHOOP!! I pinned "Trust Your Wings". It's on my Pinterest Products I Love board! So ready for summer!!! I'm ready for the lake! Yes we are ready for summer! My daughter and I are going to the beach next month, just the two of us. We are very excited to start our summer off right. I am so ready. Only 14 days left of school for the boys! Bring on the un-scheduled, relaxed, lazy days of summer! Ready for summer yes and no :) Ready for the fun summer brings and not ready to have kids home all day long everyday :) Thanks for the chance! I am SO ready for summer! The days of not having to go anywhere every day can't come soon enough! i am ready to see my bestie in texas this year for our 40th birthdays!!! Summer? Yeah - bring it on! Yes, yes, yes!! After my 2nd graduation ceremony in 3 days tomorrow night, I am more than ready!!! We are so ready for summer! Our 2-yr-old loves playing outside, so we're very thankful for this beautiful weather. I think we are definitely ready for a summer break! Ready in NC! Plenty of berries, baseball and bike rides going on (not to mention sun block). Enjoy everyone! I think so! Tickets booked, kids enrolled and the countdown has begun! Yes! Looking forward to hot days, the smell of sunscreen, icy treats, firefly nights...love summer. Hip Hip Hooray we are sooo READY!!! Bring on fun in the sun, longer days and treasured walks with the doggie! very ready! Summer in Texas means lock yourself in the AC & SEW! 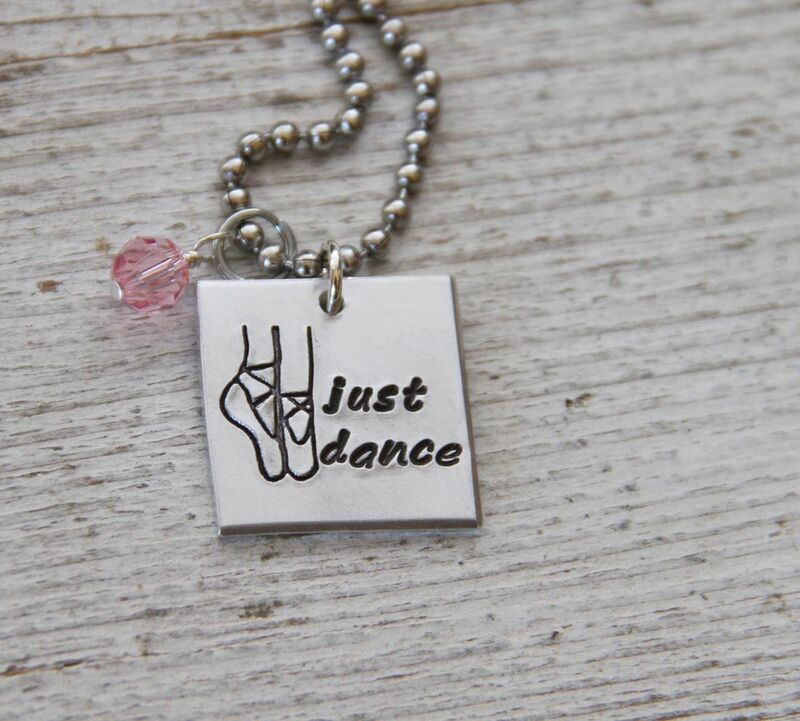 Love the new ballet necklace. Yes, ready for watermelon, camping, summer nights, and veggies from the garden. God is good. Holy crap, I'm not ready for summer. I'm 5 months pregnant, and I live in Texas. Hot hot hot. That first one is perfect! I could really use that, it'd be a great everyday reminder. And I'm more than ready for summer! In fact I don't feel like putting up with this cold for a day longer. I am not ready for summer. I can do without the humidity! plus i like sleeping in and not having to wake up to get kids ready for school . I pinned the just dance pic on my Pinterest. I am ready for summer the season but not the humidity and heat. I hope it's not as hot as it was last year! the new necklaces are darling! i am ready for the outdoors, camping, sitting on the front porch with a glass of iced tea, but not ready for the hot and humid stuff. Yes! I'm ready for more relaxed time and not such a demanding schedule! I'm not ready, however, for the hot weather! Yes...swimming...vacation to Colorado! Not ready for more heat if what we have now is a sign of more to come! WooHoo!! yes, I'm ready for summer. My children will be home from school today - their last day & I can't wait to start having some summer fun! I LOVE your new "trust your wings". I am about to send my youngest off to college and it would be perfect to give her this to remind her that she can do it!! Yes! Only six more days of school and our summer can officially start! I am SOOOOO ready for summer, to go on summer vacation! We have 5 days and 1 hour until school is out, and WE CAN"T WAIT!! Bring on summer!!!!! So ready for summer....headed across the country to see our son, his wife and our one year old baby boy! Would love to be taking a Navy design to her! This is 9 years of Navy life for them, and 3 deployments! I'm not ready for summer. We are moving in July and I'm not ready! I'm ready for beach days and relaxed schedules. I shared the military wife one on fb! My daughter & daughter-in-law (who is pregnant! Yay!) Are both airforce wives! My daughters family is in Italy! Miss them so much! My son is being moved to s.d.! Ughh! So proud of them but miss them all! i'm ready for summer! i'm ready to put this new body in to a bathing suit, go on a mini vacay, play with my kids, and sip sweet tea. bring it! I am MORE than ready for summer! Yes! I love summer and can't wait for it to get here! Thanks for the giveaway! I am slowing getting used to summer here as we tick down two more weeks of school. Every day I remember something else we've been saying we want to do, and we add to the list. can't wait! YES! Ready to spend some time with my kids and parents at the beach!!! I am already in summer mode. My deck is full of planted flowers and tiki torches. LOVING IT!! I'm beyond ready for summer...a little warm weather and ill be good! Yes! One more week of school! I am ready for summer but have to wait for the doctor to give me the okay to walk as I had surgery on my leg this week! I just have to be patient! YES! Summertime means lots of quality time with my family (and some crafting). My summer begins tomorrow after school! Posted on facebook with a link to your blog post and encouraged people to enter! I can't wait for summer! I teach kindergarteners, so I am pooped!!! Summer starts today...kids are done with school!! I think I am ready - am actually looking forward to all of the garage sales!! I am so ready for summer! Loving wearing flip flops!! I am so ready for summer, school is out in 15 days!!!! yes please! just sitting here on my first day of vacation- literally just unpacked stuff. now I just need the official summer type weather. I really want to be ready for summer, but have to get through the end of the school year. Spring just arrived here so I have to say I would like to enjoy it a bit before summer comes upon us! Totally ready for summer! Can't wait to hit the beach or the pool! YES! I can't wait to spend time with my kids and do fun things with them! Yes, my answer is always yes. I LOOOOVE warm weather and longer days and cool nights and camping on the back deck and my CSA box and fresh berries and sprinklers and feeling good. Yup, I am ready for it. Now where is it???? Oh yea! Bring it on! So ready for summer with my kids !!! Yes, I am so ready for summer! The watermelon, swimming, Independence Day! Love it all. I am ready and loving the hiking and getting the boat ready! thanks! love the new designs! Oh yes! I am so very ready for summer. Sandles & skirts and warm sunny days are all I can think about! Yes and No. I work for English language camps so my job is basically in the summer but it's 9-12 and my kids can come along so in one sense it's much more laid back than trying to get everything done after kids have gone to bed, however, I wish I had the freedom to just play and relax with my kids all day long. Thanks for the giveaway! Yes and no. Yes, for the great weather, but no for planning activities for the kids. Yes! Not necessarily the bathing suits but for the swimming and fun. Ready for summer? That's an understatement! I'm a teacher, and I'm soooo ready for summer!!! I'm so ready for the relaxing days of summer! We'll be at the pool, at baseball games, and getting organized here at home. Ready..Set...GO....to the beach. I'm ready! As a teacher who has been there every step of the way with my students and your kids, I am SOOO ready for summer! 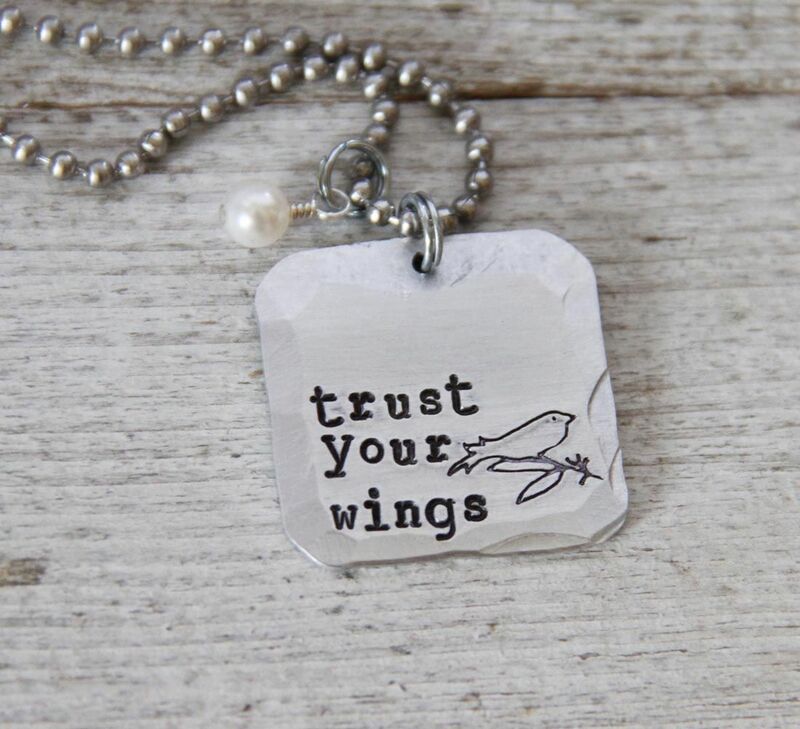 And as a sidenote, I love the "Trust Your Wings" necklace! Oh, my, yes, I am ready for summer. I cannot wait!!! I can't WAIT for summer! My kids love being outdoors and I LOVE it too! Yes...SO ready for summer. It is getting warm and I am ready to swim! I pinned the "Trust Your Wings" necklace....love it! I facebooked the link to the Trust Your Wings necklace too! I am always ready for summer ~ we had our first taste of it this past week-end with barbecues and just spending some time on the deck in the sunshine ~ of course then the after sun lotion was applied!